I like supplements. I think of them as a sort of insurance plan, and like that in under 1 minute I know I am covering my bases with the vitamins, minerals, etc. that will help me reach that goal of feeling my best. There are so many supplements that you can take on a daily basis – multivitamins, greens or protein powders, turmeric,etc. 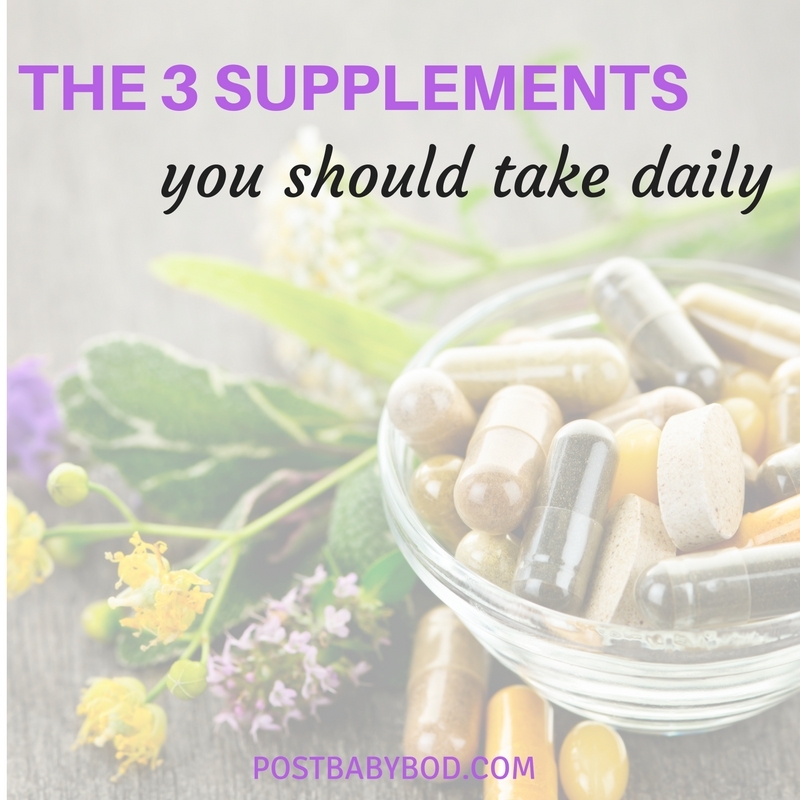 And, while each has a place in the diet, and most all offer proven research-backed benefits, there are 3 supplements that you should definitely include in your daily rotation. Put the supplements somewhere you’ll remember to take them (like next to your coffee mug!) and make it a goal to take them daily. Even after you have your babe you should continue to take your prenatal, especially if you’re breastfeeding. It will cover your bases of essential nutrients for the day. If you are not breastfeeding and you don’t plan to continue having babies you can shift to a woman’s multi. I’m a huge advocate of prenatal’s and multi’s that come from real food (versus synthetic isolated vitamins) so look for vitamins out there that are processed this way. MegaFood is a great option. And, because it’s food based you should have no problem taking it on an empty stomach. Not into a multi? There are 3 essential nutrients then that we’re most commonly deficient in that you should be taking instead. These include folate, Vitamin B12 and Vitamin D.
Numerous health benefits have been associated with the presence of Omega-3 fatty acids in our diet including reducing inflammation and lowering the risk of heart disease. We cannot produce omega-3s in the body and therefore are required to intake them through food or supplement. While most people say any fish oil supplement will do, I’m a huge advocate of cod liver oil. In addition to Omega 3s, cod liver oil will give you a nice dose of Vitamin D ( nutrient we can all use more of, even on top of your multi/prenatal). By now most of us have learned the gut health is a powerful thing and everything we feel, both physically and emotionally, is now believed to be directly linked to your gut. There are numerous studies now published showing us that the state of our microbiome, and the number of friendly, health promoting bacteria, is pretty much linked to every.single.system in your body. It determines how efficiently our systems run, including affecting your metabolism, immune health, neurotransmitters & the central nervous system, nutrient absorption, and levels of inflammation in the body. We can all benefit from a daily boost of microflora and i recommend purchasing one that contains at least 10 billion CFUs. Finally, for those nursing mamas out there, all 3 of these supplements are breastfeeding friendly. I’ve recently started adding collagen to my morning coffee. I have only been doing this for about a month now but I believe I am starting to see benefits in my digestion already. I am hoping it will aid to prevent joint issues and also improve my hair, nails, and skin. Can you recommend a good brand of probiotics that are shelf stable? I currently use Garden of Life for women (which I love!) but they need to be refrigerated, and I have some travels coming up that will make it difficult to keep them cold. Thanks!